November 6, 2013 – Osborne, Kansas – Osborne Industries, Inc., is proud to introduce all new Stainless Steel Rectangular Hog Feeders to their quality line of swine management equipment. Double-sided wean-to-finish rectangular feeder models are available for dry and wet/dry feeding. The feeders are constructed with heavy duty, 304 welded stainless steel that provides reliable, durable, and long-lasting performance for years of operation in hog finishing facilities. The rolled edges provide structural strength as well as safety from sharp edges. The simple adjustment system promotes optimum feed efficiency and deep head entry into the feed trough helps achieve Osborne’s signature “no waste” pig feeding. Solid divider panels with pre-drilled holes allow for splitting the feeder among sort and grower pens, while the pre-drilled holes and knockouts allow for mounting the feeders in multiple applications. For more than 30 years, Osborne Industries has provided efficient, durable feeders to hog producers all over the world. 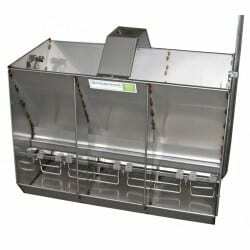 The Big Wheel Hog Feeders, Osborne’s other line of pig feeders, are among their trademark products. The round trough of the Big Wheel Feeders not only increases feed conversion rates, but radically reduces feed waste with their mechanical flow design. The feeders are easy to clean and allow for fresh feed to always be available to growing animals. These quality feeders are available in a variety of options, and are available in nursery, wean-to-finish, finishing, outdoor and ad-lib sow models. Osborne feeders continue to set a new performance standard in the industry, and Osborne strives to make quality assurance a top priority for all their swine management equipment. For more information about the new rectangular feeders or Osborne’s complete line of swine management equipment, call the pig feeding experts today at their toll free number, 1-800-255-0316, or visit osbornelivestockequipment.com!